Listed on this site are Boy Scout, Girl Scout, International Scout Memorabilia such as CSP’s, LSP’s, OA Flaps, OA Patches, Jamboree Patches, Camp patches and Scout Insignia. You will also find pins, hats, uniforms, handbooks, International Scout Organizations and Scouting literature as Handbooks, resource books and Books by the Founders. Browse and find the items you are missing. Our Featured Items of Boy Scout, Girl Scout and International Scout Memorabilia are under Tab “1 – Eagle Snags” to the left. Trading Eagles is the dealer in a Boy Scout, Girl Scout, International Scout Memorabilia. 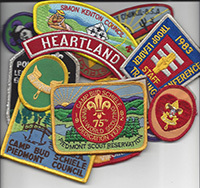 Our Inventory features Boy Scout CSP’s, LSP’s, OA Flaps, OA Patches, Jamboree Patches, Camp patches and Scout Insignia. We have scout pins, hats, uniforms, handbooks, International Scout Organizations and Scouting literature such as Handbooks and Resource books. If you need any Books by the Founders, Girl Scout, Girl Guides and Rover Scouts, we have them. Inside also you will find American Red Cross/American Heart Association, Military Memorabilia, Numismatic items and many other collectibles. We have over 5,000 different items of Boy Scout, Girl Scout, International Scout Memorabilia listed on this site. Browse for Boy Scout, Girl Scout, International Scout Memorabilia in our store, click on the “Details” thumbnail images. There you can view the details of the item, and the current item Inventory. Browse through our Boy Scout, Girl Scout, International Scout Memorabilia catalog. We have CSP’s, LSP’s, OA Flaps, OA Patches, Jamboree Patches, Camp patches and Scout Insignia. On tradingeagles.com you will find scout pins, hats, uniforms, International Scout Organizations, scouting literature such as Handbooks and resource books. Looking for Books by the Founders look for them here. Remember to Bookmark tradingeagles.com for future visits. New items are added daily for CSP’s, LSP’s, OA Flaps, OA Patches, Jamboree Patches, Camp patches and other Scout Insignia. If you need pins, hats, uniforms and handbooks, we have them. We also daily add International Scout Organizations, and scouting literature such as Handbooks, resource books and Books by the Founders. Do not miss the opportunity to fill your needed items of Boy Scout, Girl Scout, International Scout Memorabilia items, you must come back to tradingeagles.com frequently to see what we added. The saying around collectors is ” If you see it, Buy it, it may not be there tomorrow”. If you do not see your item contact us at sales@tradingeagles.com. Currently our inventory is over 100,000 Boy Scout, Girl Scout, International Scout Memorabilia items. Although we have many items on our site, we still have a huge inventory of items that we do not have on tradingeagles.com. Please contact me at Mark@tradingeagles.com with your needs and wants. Customers can trade all the Boy Scout, Girl Scout, International Scout Memorabilia items on this website are available. Consignment items are the only EXCEPTIONS and they cannot be traded. 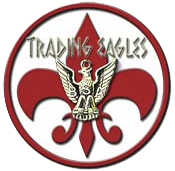 Customers wanting to trade must contact me by email at Mark@tradingeagles.com with the item you want and what you have to trade. I make value for value trades only, send an email to Mark@tradingeagles.com, there are no trades on consigned item. All of our items you can make a counter purchase offer by sending an email to Mark@tradingeagles.com. The only EXCEPTIONS are those Boy Scout, Girl Scout, International Scout Memorabilia items listed on the consignment pages. There are organizations around the world for Boy Scout, Girl Scout, International Scout Memorabilia that are dedicated to accumulating and disseminating Scouting memorabilia information. Two of these Scout collecting organizations are Scouts on Stamps Society International (SOSSI) and the International Badgers Club. The International Scouting Collectors Association, and the Scout Memorabilia Collectors of Canada are a couple more of the resources available to collectors of Scouting memorabilia. Some of these Boy Scout, Girl Scout, International Scout Memorabilia organizations produce collectors’ guides and buyers’ guides. They cover Boy Scouts of America insignia and International Scout Memorabilia to help the collector identify and categorize their collections. Prominent collectors in the hobby have written collector guides such as Streamwood.net, Terry Grove and MitchReis.com. Recently the concept of marketing memorabilia for monetary gain has become popular fund raisers. Most Scout councils and the National Council are very market savvy and as a result they now produce collectibles Scout items. Collector items are meant primarily and specifically for collectors and serve no other Scouting purpose. For collectors and dealers of Scout memorabilia the International Scouting Collectors Association promotes education in the history of the Scouting Movement through the collecting and trading of Scouting Memorabilia. We accept Visa, MasterCard, American Express, personal checks and Money Orders. Personal checks will take 10 days to clear before shipping. After your your personal check, credit cards and money orders clear our bank we will ship within 72 hours. MAKE CHECKS AND MONEY ORDERS OUT TO “Mark James”. Checks and Money Orders are returned if not made out to “Mark James” and we will not ship your order until new payment is received. We developed consignment pages for collectors to sell their Boy Scout, Girl Scout, International Scout Memorabilia. Click on the consignment buttons for consignment items that are currently on tradingeagles.com. Request a consignment agreement for your Boy Scout, Girl Scout, International Scout Memorabilia items by emailing Mark at Mark@tradingeagles.com. There are 12 bullet items that you are to agree to and you are required to send your collection to me for identifying and categorizing. Owner ship of your collection remains with you. In selling scout memorabilia the three most important things to remember are condition, catalog type and total amount produced. Therefore used items do not sell or they sell at a much lower market price. You need to know that most activity patches produced after 1970 sell in the $.25 – $.50 range. They also take more than 150 days to sell and can take up to years to find the right buyer. Damaged items do not sell and are not listed and are held until completion of the contract. Your memorabilia is marketed on tradingeagles.com for a period of 150 days. Your items are displayed at the trade-o-rees that I attend during the 150 days. I attend 5 – 7 trade-o-rees a year. You MUST BE 18 YEARS OLD OR OLDER to sign my consignment contract. Under 18 years old must have your parents sign the agreement with you. When your contract expires after 150 days, you are given the opportunity to decide how to dispose of the items that are left . Your options are: 1) I’ll make you an offer. 2) You donate the remaining items to young scouts by authorizing me to give them away. 3) I’ll ship the items back to you at your cost for shipping. 4) I will offer to extend your contract for a mutually agreed upon time. Customers wanting to trade or make a price offer on consigned items I cannot accept the price changes or trades without the owner’s permission. ALL BOY SCOUT, GIRL SCOUT, INTERNATIONAL SCOUT MEMORABILIA ITEMS KNOW TO BE FAKE OR SPOOFS ARE IDENTIFIED IN THE DESCRIPTION. Hang up your hat, pull up a log around the campfire, have a cup of coffee. Enjoy browsing for Boy Scout, Girl Scout, Girl Guides, Rover Scouts and International Scout Memorabilia in our store. Thank you for visiting our website we look forward to seeing you again.